Tiger Woods' first victory in five years gave a huge viewership boost to NBC on Sunday. Tiger Woods' first victory in five years on Sunday came with a huge ratings boost. NBC's coverage of the Tour Championship earned a 5.2 overnight rating. That's a spike of 206% over last year's tournament. Sunday's final round was the highest-rated telecast in the history of the FedExCup Playoffs since its inception in 2007. It was also the highest-rated PGA Tour telecast of 2018, excluding the four major championships, which are The Masters, the US Open, the British Open and the PGA Championship. Nielsen takes the percentage of households watching in 56 US markets and comes up with an overnight average. That means that 5.2% of households in these 56 markets tuned into Woods' win, his 80th overall, on Sunday. NBC's coverage peaked at a 7.19 rating as Woods finished his round, ending his long victory drought. 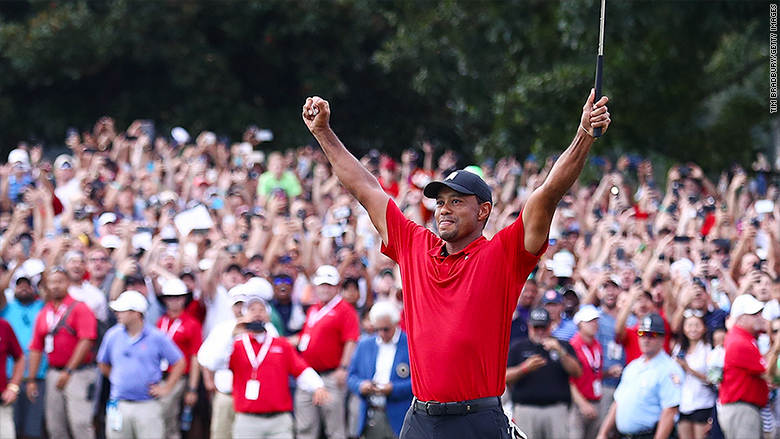 "Tiger Woods' win at the Tour Championship was an unforgettable event in golf," said Mike McCarley, President of golf for the NBC Sports Group. "The massive gallery following Tiger up the 18th fairway was matched by record viewership across NBC Sports' platforms." Woods entered this year still one of the most popular and most watched names in golf, despite not having a victory since 2013. He earned 580 minutes of exposure during tournaments by mid-March, according to Nielsen. That's more than double the average of the next 10 golfers when ranked by exposure.